Cuboy Back To The Cubeture Era 2 is a new point and click adventure game from ediblecastle. 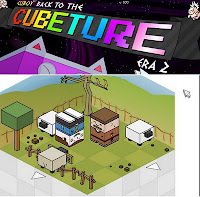 Here in Back To The Cubeture 2, our cube hero Cuboy kicks off in ancient times. Boss is missing, the Evil Padrino is taking over and the lord of the underworld has stolen the time warper device. Guide Cuboy and once again, save the day for goodness' sake. This game is played using the mouse clicks to control Cuboy and interact with people and objects in the game world. You will also use your keyboard in various minigames where the instructions will be given to as well. Meanwhile, here is Cuboy Back To The cubeture Era 2 walkthrough showing the game played.